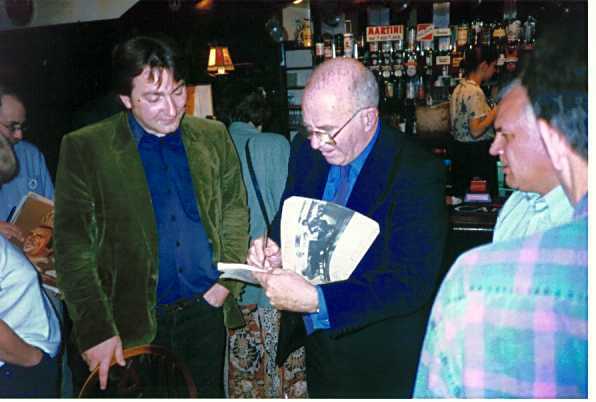 Here's Ian Sorensen's photo of Gerry persuading some guy to sign his First Folio at the post-gig reception in Buxton. Gerry wrote this review of the 1998 Buxton concert. Good times. Thanks, Ian C, for passing on the sad news. Gerry was a delight to talk to, when we finally met, and by far the most accomplished musician of the lot of us. (The late Paul Gunningham ran him a close second.) And as you can see from the photo, he could really rock a green corduroy jacket. When I hear Sessionman's Blues, I always picture Gerry as the eponymous sax player, doubling on baritone. My condolences to his girlfriend, family and the rest of the MVs who knew him. I had intended to get back to you sooner on this, Ian, just to say what a lovely tribute it is to Gerry. I'm sure he would have been pleased. Thank you.